Putting accessibility at the heart of your organisation. 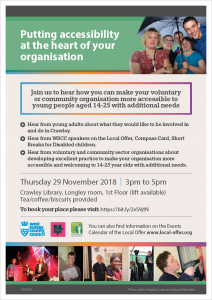 Are you interested in hearing how you can make your voluntary, community or sports organisation more accessible to young people aged 14-25 with additional needs. FREE event 29th November Crawley Library – booking essential on Eventbrite Open to all voluntary and community groups working in Crawley. Book soon – closing date for bookings Friday 23rd November. All welcome to attend, but please do book. Apologies if you’ve received this invite more than once.